Higher-order integrative cortical areas, called association areas, intervene between the sensory inputs and motor outputs. Hierarchical organization of the cortex was proposed in the 1870s by the famous British neurologist, John Hughlings Jackson. These association areas are the site of cognitive processing and are the focal areas in the rapidly developing field of cognitive neuroscience. Locations of primary, unimodal, and multimodal (Anterior, Limbic, Posterior) areas. Select any label to highlight. Three multimodal association areas will be discussed in conjunction with three unimodal association areas and three primary sensory areas. Located in the anterior-ventral portion of the temporal lobe, the parahippocampal gyrus. Links emotion with many sensory inputs. Important in learning and memory. Located at the junction of occipital, temporal and parietal lobes. Important in perception and language. Located in the prefrontal cortex. Links information from other association areas. Important in memory, planning, and higher-order concept formation. Three unimodal association areas are located adjacent to their respective primary sensory cortical areas as shown in the figure. The general principle to be learned here is that as one gets further away from the primary sensory areas the associative functions become more general. Sensory information is processed and sent from receptors along parallel pathways through primary sensory cortex and unimodal association cortex to the posterior multimodal association cortex of each hemisphere—the posterior parietal and temporal cortices. The posterior multimodal association cortex is highly connected to the anterior association areas which in turn are responsible for conceptual cognitive functions and planning motor actions. After planning motor actions in the anterior association area, the actual processing of the motor response output is the reverse of processing in the sensory (input) system. The premotor cortex is rostral to the motor cortex—Brodmann’s areas 6 and 8. Flow of information in the motor system is the reverse of that in the sensory systems. Retrieval of information that has been learned apparently is also a reverse of the paths and structures used in storing this information. Damage to posterior association areas also sometimes including parts of the unimodal association areas can result in agnosia, a Greek word meaning “not knowing.” Lesions of the visual posterior association area can result in the inability to recognize familiar faces or learn new faces while at the same time leave other aspects of visual recognition intact—a deficit called prosopagnosia. These patients can identify a face as a face, its parts, and specific emotions from facial expressions, but they cannot identify a face as a particular person. They often cannot recognize relatives such as parents or children and in some instances cannot recognize their own face. They have not lost knowledge about their close relatives and friends because they use sound of the voice and other cues to recognize them. Lesions causing prosopagnosia are always bilateral on the inferior surface of both occipital lobes and extend forward to the inner surface of the temporal lobes. Patients with lesions in the posterior multimodal association cortex (i.e., posterior parietal cortex) can perceive and draw objects, but they cannot name them—a deficit called associative agnosia. They haven’t forgotten the names of these objects because they can correctly name them by touch. Other damage to the occipital lobes and surrounding region can render patients unable to draw objects, but remarkably can still name them—a deficit called apperceptive agnosia. Patients with associative agnosia can copy drawings, but cannot name the objects, while patients with apperceptive agnosia are unable to copy drawings, but can name the objects. Animation showing how a patient with left or right TPJ damage might attempt to copy a drawing. There are other cases where lesions in similar areas of the right and left hemisphere produce almost complementary perceptual differences. Right hemisphere damage disrupts perception of global objects, while left hemisphere damage disrupts percept of local objects. This is found only in acute stages immediately after a stroke and only with lesions centered in the temporal-parietal junction (TPJ). Animation showing how a patient with right posterior parietal lesions shows left visual neglect. Agnosias of right posterior parietal visuocortex are some of the most remarkable. The multimodal posterior association area receives inputs from the visual and auditory systems and from the hippocampus. They result from an inability to perceive objects despite normally functioning sensory systems. These patients ignore things on the left including the left halves of objects and the left half of their own body. This is called contralateral neglect syndrome. Contralateral neglect is a deficit in the self-image on the left side of their body and a deficit in perceiving the world on the left side. Typically, patients suffering from contralateral neglect syndrome will have paralysis on their left side. Some patients will not wash or dress their left side—personal neglect syndrome. This neglect may extend to disowning the left side of their body. They will make remarks such as “Who put this arm in my bed” when referring to their left arm. The neglect can extend from their personal space to the world around them. They may draw a flower, for example, with the petals only on the right-hand side, or clock numbers only on the right-hand side, etc. A little thought will convince you that it is not a sensory problem. Not just the right half of all objects in the environment have input into such a patients sensory system. Most objects are made up of multiple parts. You can think of these parts as objects. So for example, each petal of the flower is an object. They don’t “see” just the right half of each petal. This is the infinite regress problem. To show you how complicated and complex this visual neglect problem can become there was a study of a group of visual-neglect patients in Milan, Italy. 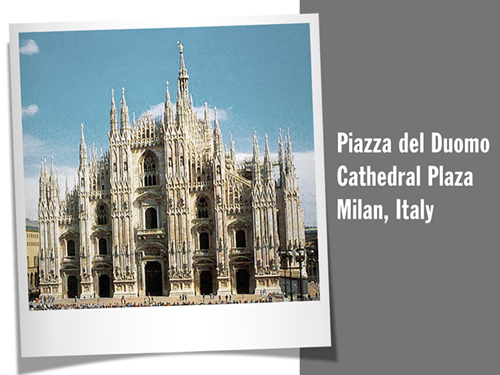 They were asked in the hospital examining room to imagine the well-known public square, the Piazza del Duomo. They were told that they should imagine that they were facing the cathedral. They were then asked to recall all of the buildings on the square. They recalled only the buildings on their (imagined) right. Then they were told that they were standing on the steps of the cathedral, and imagine that they were facing in the opposite direction. Once again, they were asked to recall all of the buildings on the square. What they did was to recall all of the buildings that they had failed to recall during their first recall because the buildings that were previously on their left are now on their imagined right. Remember this is all in their imagination—their memory. Piazza del Duomo cathedral in Milan, Italy. This is dramatic evidence of a processing deficit. 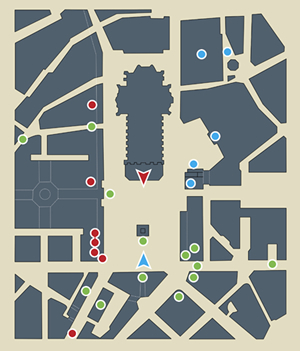 These patients’ memory of the Piazza del Duomo is complete; they don’t have memory deficits about any portion of the square. They also have complete access to their memory of the square. But depending upon their imagined perspective they have a deficit in recalling objects on the left side of their frame of reference. Furthermore, they are apparently unaware of this deficit. Their frame of reference is centered with respect to their body, in memory as well as in real life. Apparently, memories like real world scenes are accessed through the contralateral hemisphere. It is not that the memories were laid down with objects on the left missing because they grew up knowing this square long before their brain lesions occurred. This raises issues of consciousness, self-awareness, executive control of memory. To further complicate matters unilateral visual neglect can be centered with respect to the object instead of the patient’s body. A patient with object-centered unilateral visual neglect. Left: patient attends to examiner’s left hand even when rotated. Right: patient neglects examiner’s right hand even when examiner’s body is rotated 90 degrees. Bilateral parietal damage can produce what is called Balint’s syndrome. This is an interesting syndrome because rather than neglecting both sides of objects and seeing nothing as one might expect with bilateral hemifield neglect, they see one object at a time—simultaneous agnosia. These patients report that an object appears automatically and is replaced at random with another object and they have no control over what object will be perceived. These patients have ADL problems included getting lost, inability to grasp items and they cannot eat, dress, or move around a room without assistance. They can, however, correctly touch parts of their own bodies. The limbic association area receives information from virtually every other association area and therefore can relate all the stimuli of an event, including its emotional context. The emotion associated with an event can determine whether or how long it is remembered. This is important for survival of all organisms. Indeed, this is what is meant by learning. You can’t have learning without memory. When hungry it is a great relief to find food and then one is more likely to remember the food place later. When one narrowly escapes danger, one is more likely to avoid such predators and places where they reside. The patient HM had his limbic association areas removed bilaterally, he could not form any new explicit memories which rely on context memory, including place, time, and emotion. Schematic illustration of path of tamping iron through Phineas Gage’s brain. The anterior association area is in the frontal lobes. It is rostral to the postcentral gyri, Rolandic fissure, and premotor areas. It has Sylvian fissure as its posterior boundary. It is referred to as prefrontal cortex. Early evidence of the role of prefrontal cortex came from the case of Phineas T. Gage. Gage was a foreman on railroad construction in the middle of the 19th century. He was reliable, well organized, and hardworking He was tamping in an explosive in a hole drilled into rock with a 13 pound, 3½ foot long iron bar. The charge unexpectedly exploded as he was packing in the explosive charge. What happened was that the tamping rod blew out of the hole and went through the front of his head, destroying large portions of his prefrontal cortex. After he recovered physically (remarkably only a few weeks), his personality had changed. Co-workers reported that “Gage was not Gage.” He was unreliable. His actions were impulsive with little regard for consequences. He became an alcoholic and drifter. Prefrontal lobotomies were performed in the first half of the twentieth century to relieve psychotic symptoms. These have now been replaced with drug therapy. With a unilateral or bilateral prefrontal lobotomy there is a lack of ability remember and relate things over time. Delayed reward has a greater detrimental effect on learning. Attention span and ability to concentrate are greatly diminished. Abstract reasoning largely disappears. The prefrontal cortex receives massive inputs from the sensory association cortices (somatosensory, visual and auditory) and also from the dorsomedial nucleus of the thalamus. Lesions of the dorsomedial nucleus of the thalamus can produce many of the same symptoms as from prefrontal lobotomy. Major fiber bundles that interconnect association areas. The prefrontal cortex is subdivided into three areas. Subdivisions of the prefrontal cortex of the monkey brain. Prefrontal syndrome (or frontal syndrome) in patients usually refers to damage of the dorsal (superior) prefrontal association area. Most research in the dorsal prefrontal area is concentrated within the dorsolateral prefrontal area. This is the area (46) in the above diagram just dorsal to the principal sulcus (Figure 9.10A). This is a very important area for many higher-order cognitive abilities. The dorsolateral prefrontal area along with the cingulate cortex are involved in attentional processing, planning, rule learning and memory. When trying to perform arithmetic, for example, the patient may begin successfully on successive subtractions of 7 from 100 but then inexplicably shift and say: “100, 93, 93, 73…63 instead of 100, 93, 86, 79, 72 etc. When sequences are being learned, the dorsolateral prefrontal area and the cingulate cortex are highly active. But once learning is complete and automated these areas are no longer active. Many neurons in the dorsolateral prefrontal area and those in the principal sulcus itself (i.e., dorsal and medial prefrontal cortex) mediate memory about WHERE an object is located. These neurons receive inputs from a dorsal pathway through the posterior parietal cortex. Recordings in monkeys show that “where” neurons respond only to stimuli in a particular position in the visual field and continue to fire during a delay period—presumably memory for the event. When occasionally they stop firing during the delay period, this usually signals that the monkey has forgotten the location. Eye-tracking devices are used to record where the monkey is looking, and the monkey is trained to look towards a particular remembered location. In contrast to the dorsolateral prefrontal area, neurons in the small area (46) in Figure 9.10A just ventral to the principal sulcus mediate memory about WHAT the object is, its shape and color. This is a target of the ventral visual pathway through the inferior temporal lobe. Output destinations of parietal and prefrontal association areas to limbic system areas (1) on the medial surface, superior temporal cortices (2) on the lateral surface, and subcortical areas (3). Press the labels to see the pathways. The orbitofrontal cortex and the medial prefrontal cortex have direct connections to the amygdala and cingulate cortex of the limbic system and thus provide the emotional component to the planned behavior and memory. The dominant neurotransmitter in the prefrontal region is dopamine. Dopamine depletion can create lesion like symptoms. Disturbances of the dopaminergic system are thought to contribute to symptoms of schizophrenics and many schizophrenics have hypofunction of the prefrontal cortical regions. Symptoms such as being controlled by alien voices suggest a dysfunction of the executive control system in schizophrenics. For example, if schizophrenic patients are tested on the Wisconsin Card Sorting Test blood flow to the prefrontal areas is much less than normal individuals. Blood flow to the prefrontal areas is shown to be a functional part of performing this task accurately because when schizophrenics are rewarded for their correct responses blood flow increases much more than it does for normals and they show improved performance. Further evidence for the close interaction between the prefrontal cortex and cingulate cortex is that neuroimaging of schizophrenics shows impaired activation of the cingulated cortex in cognitive tasks and postmortem histological analysis has shown abnormalities in the cingulated cortex of schizophrenics. Another way to determine whether or not functions are lateralized to one hemisphere or represented in both hemispheres is to test split-brain patients, patients that have had their corpus callosum transected. Sectioning the corpus callosum is a last resort treatment of intractable epilepsy. Stimuli can then be input to only one hemisphere without the other being aware of these stimuli. Patients can be tested to see how they process these stimuli. An object in the left visual field excites areas of the right hemisphere because signals from the left nasal retina are transferred contralaterally and those from the right retina are transferred ipsilaterally. Split-brain patient looks in the center of the screen and indicates what he saw. He can name the object or select an object by touch and pointing. Stimuli are presented to only one hemisphere tachistoscopically. Patients focus on a point straight in the middle of a screen. If the stimulus appears on the left, it goes to the right hemisphere. If the stimulus appears on the right, it goes to the left hemisphere. So, in response to an cone presented on the right (left hemisphere), the patient says “cone.” But when presented on the left, the patient denies seeing anything, and when pressed to give a response, the patient confabulates. So, when the cone stimulus is on the left, is the patient incapable of recognizing the visual stimulus as a cone? Actually, the patient is capable of recognizing the stimulus as a cone. But you have to be clever to show this ability. The patient can correctly choose, by feel, the correct object. Or the patient can correctly identify it by pointing to it, but only with his left hand. One might say that this is just matching—even cross modality (visual to haptic) matching—but not language. But you can convince yourself that this is really language because, if you flash the letters D-O-G to the right hemisphere, patients can pick out the model of a dog---only with their left hands, of course. Other results from split-brain patients have shown that for most people, the left hemisphere is dominant for mathematics as well as language. The right hemisphere is dominant for music, face recognition, and anything to do with spatial relationships. For example, even right-handed patients after corpus callosum resectioning (split brain) are better able to draw with their left hands than with their right hands because it is the right hemisphere that controls the left hand. Thus, the right hemisphere has some functions that are superior to those of the left hemisphere, and the right hemisphere is not just like the left hemisphere without language. Other examples of superiority of the right hemisphere would be that split-brain patients can fit wooden blocks together of different colors to make a pattern better with their left hands than with their right hands, again showing that the right hemisphere is superior in spatial-perceptual tasks. In conclusion, functions of the brain that are localized to specific brain regions have had considerable clinical importance. Localization of function can explain why certain syndromes are characteristic of disease in specific brain regions. Nevertheless, no part of the brain works in isolation. Each and every part of the brain works in concert with every other part. When a part of the brain is removed, the resulting behavior may reflect more about the adjusted capacities of the remaining “parts” than the removed part. A 43-year old cerebral vascular accident patient was diagnosed as having persistent unilateral spatial agnosia or "visual neglect". What cerebral region was most likely involved? A. Non-dominant parietal-occipital cortex This answer is CORRECT! Lesions of the right posterior parietal visuocortex (i.e., parietal-occipital cortex) most likely produces visual neglect. This would be in the right hemisphere for right handers producing left visual neglect. While occasionally lesions of the dominant parietal-occipital hemisphere (e.g., left hemisphere in the right handers) can produce visual neglect on the dominant site, it is less likely than the correct answer. B. Dominant parietal-occipital cortex This answer is INCORRECT. This brain area is not typically involved with visual neglect. C. Dorsal prefrontal cortex This answer is INCORRECT. D. Dominant temporal-occipital cortex This answer is INCORRECT. E. Non-dominant temporal-occipital cortex This answer is INCORRECT.